The Wharton School of the University of Pennsylvania is pleased to announce that William P. Lauder, W’83, has committed $4 million to endow the William P. Lauder Wharton Leadership Fellows Program. Mr. Lauder is a member of the University of Pennsylvania Board of Trustees, the Lauder Institute Board of Governors, the Wharton Leadership Advisory Board, and a lecturer in the Wharton School. Leadership Fellows are a community of second-year MBA students who mentor, coach, and support first-year students in developing their potential and strengthening their performance as learning teams. Over the course of 15 months, the fellows receive intensive leadership development opportunities that first focus on enhancing their own abilities and then transition to hands-on experience building those skills in others. Fellows play a critical role in strengthening team dynamics, providing feedback, addressing conflict, and coaching individual growth and development. This gift continues the Lauder family’s longstanding commitment to supporting education and the Penn community — from the Lauder Institute, to student fellowships, to numerous capital projects, including the recently completed New College House at 3335 Woodland Walk — and enriching the Penn experience for future generations of students. 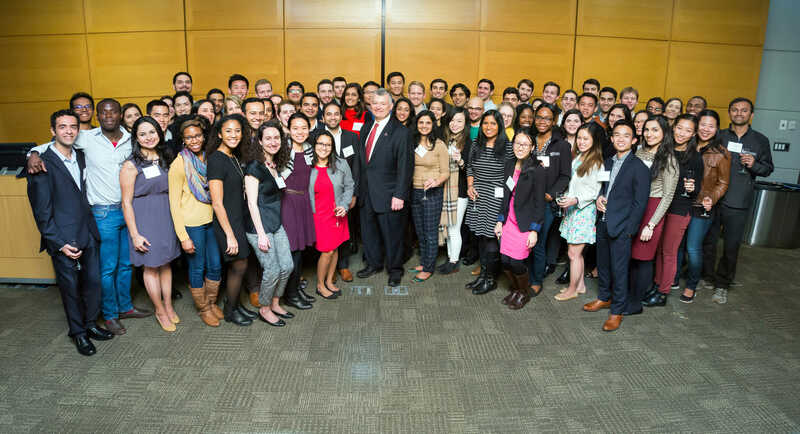 Income from the endowment will provide sustainable resources to select, train, and support the Wharton Leadership Fellows in their work with first-year MBA students. Mr. Lauder’s gift will also bring a new one-day leadership symposium to the William P. Lauder Wharton Leadership Fellows Program dedicated to exploring leadership principles in action. Mr. Lauder is already known as an innovator among the Wharton faculty. The course he created and teaches, MGMT 892: Decision Making in the Leadership Chair, now in its sixth year, brings renowned business and civic leaders into the classroom each week to share lessons from their careers with second-year MBA students. In 2014, Mr. Lauder was recognized by his fellow faculty members with the Teaching Commitment and Curricular Innovation Award for the by-application course, which consistently ranks among the school’s most popular electives. William P. Lauder is Executive Chairman of The Estée Lauder Companies Inc., a global leader in prestige beauty. Since joining the Company in 1986, Mr. Lauder has been instrumental in expanding the Company’s brand portfolio, distribution channels and international presence. Under his leadership, the Company pioneered its online business, developed successful new brands, such as Origins, and acquired pioneering brands, such as Aveda, Bobbi Brown, M∙A∙C, and Smashbox. Mr. Lauder was Chief Executive Officer of the Company from March 2008 through June 2009 and President and Chief Executive Officer from July 2004 through February 2008. From January 2003 through June 2004, he was Chief Operating Officer. Mr. Lauder is a member of the Board of Trustees of the University of Pennsylvania and an Emeritus Trustee on The Trinity School Board in New York City, his alma maters. He also serves as Chairman of the Board for the Fresh Air Fund and as Co-Chairman of the Board of the Breast Cancer Research Foundation. Mr. Lauder’s additional board memberships include The 92nd Street Y, The Kailash Satyarthi Children’s Foundation and Zelnick Media and Wharton’s own Leadership Advisory Board, run out of the McNulty Leadership Program. In 2012, Mr. Lauder was appointed to the faculty of the Wharton School of the University of Pennsylvania, where he teaches “Decision Making in the Leadership Chair,” a course he designed for second-year MBA students. He is a son of Mr. Leonard A. Lauder and Mrs. Evelyn H. Lauder, and a grandson of the Company’s founder, Mrs. Estée Lauder.